[EAN: 9780704344402], Used, very good, [PU: -], Women and Self-harm (The Women's Press handbook series) This book is in very good condition and will be shipped within 24 hours of ordering. The cover may have some limited signs of wear but the pages are clean, intact and the spine remains undamaged. This book has clearly been well maintained and looked after thus far. Money back guarantee if you are not satisfied. See all our books here, order more than 1 book and get discounted shipping. [EAN: 9780704344402], [PU: The Women's Press Ltd], PSYCHOLOGY & PSYCHIATRY, This is an ex-library book and may have the usual library/used-book markings inside.This book has soft covers. In good all round condition. Hundreds of thousands of women self-harm, but there has been no book to date which comprehensively explores this self-destructive behaviour. 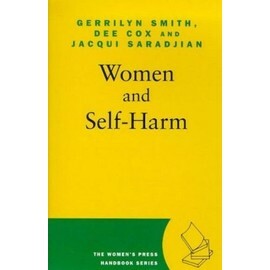 Now this powerful book looks at the reasons why women self harm and describes the experiences of those who do so. It examines the social, emotional and psychological resons for self-harming; and the physical, social and emotional consequences. It provides a comprehensive range of resources for help and advice and suggests strategies for recovery and healing. Including the voices of a wide range of self-harming women, it gives a vivid picture of the self-harming experience and will be essential reading for all those women who currently self-harm; their relatives and friends; professionals in fields where self-harming exists; and all those interested in this wide-ranging phenomenon.